The history of the Dutch within present-day New York City has long been overshadowed by the British in our popular historical narrative. However, Dutch influences and contributions remain throughout the physical and cultural landscape. Within Brooklyn and Queens historical archaeology has looked at material culture, architecture and documentary history to better understand Dutch-American lifeways and contributions to the history of New York City. Studies of properties such as the Onderdonk House, the Hendrick I. Lott House, and Pieter Claesen Wyckoff House provide insight into the development of the City and our collective history. The Onderdonk House is a charming and well maintained early 18th to late 19th century house, a combination of Dutch and later architecture. It is named for the two Dutch Families who lived there. It was built by Paulus Vander Ende, a Dutch farmer around 1709 on the land previously owned by Hendrik Barentsz, a silversmith and farmer who lived there around 1650. 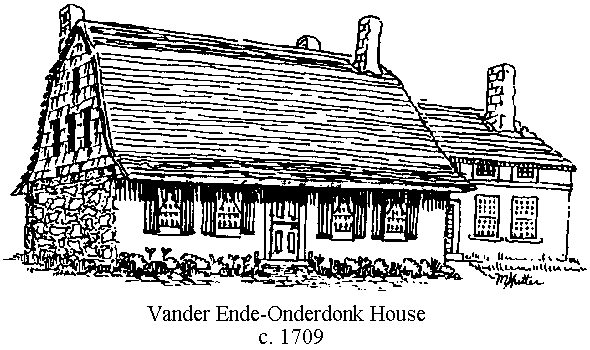 The Onderdonk family, also Dutch farmers, bought the house at the beginning of the 19th century and successive generations of Onderdonks lived in the house for almost 100 years. If you would like to support our programs or become a sponsor of one of our upcoming events, visit us on the web: http://newamsterdamhistorycenter.org/support. You are receiving this email because you are a current or past member of the NAHC or have attended one of the events organized by the NAHC. Bus Q-54 passes and stops two blocks away at the intersection of Flushing and Metropolitan Avenues. Bus B-57 passes the house on Flushing Avenue. “L” subway line to Jefferson Street (Brooklyn) stop; proceed five blocks North (right) along Flushing Avenue. On street car and bike parking is available, plentiful and free!